Our Crow likes clean food. This is the 2nd year that this crow (at least we assume it's the same one) has shown up on our property. He or she is half of a pair and so soon we should have the family show up. Last year it showed up and started to leave half dead snakes in our birdbaths but now it is also leaving bits of dead birds. 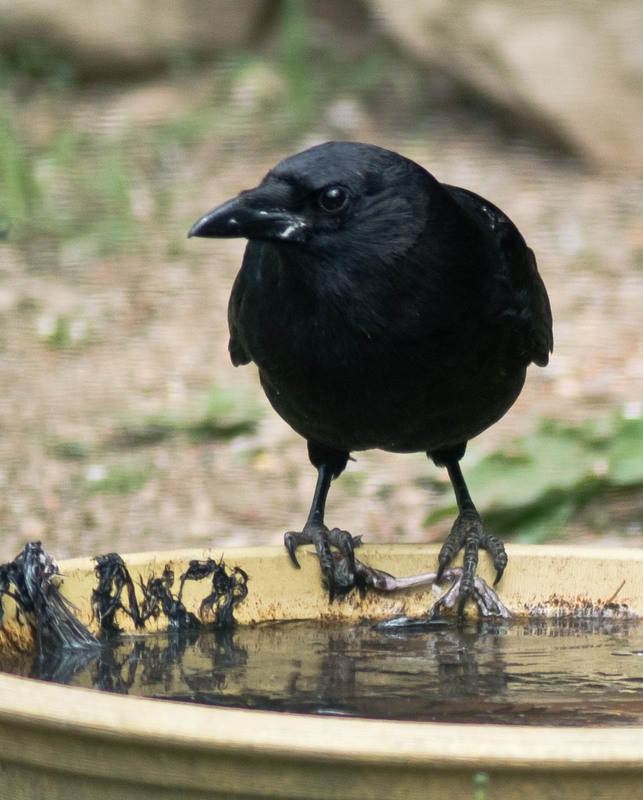 Not the most pleasant of scenes and it makes a mess in the birdbath but does make for some great photo ops. Shot with my Tamron 400/4 thru the kitchen window. ps I have no idea why it leaves things in water. It will even wash chunks of suet before eating them at times. I'm thinking those are from the window though I don't remember seeing them before. Maybe from PP? I will have to see if they are are on all the shots thru that window. I have a blind set up outside but with the crow unless I have lots of time to sit and wait I usually have to shoot from inside. Can't figure out the squiggly lines. Only present on the shots when he was at the bath. If he was back where the feeders are (where the lines in this pic are) there were none. Something to do with the light or angle I was shooting thru the glass I guess.